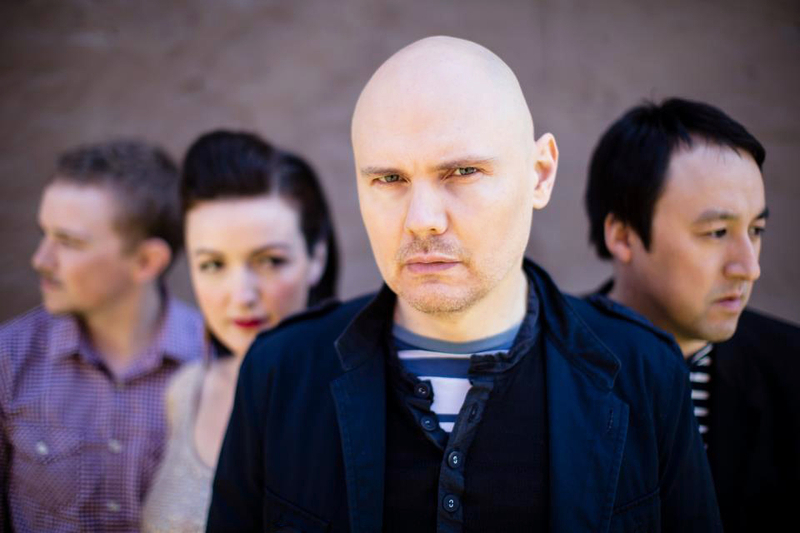 THE SMASHING PUMPKINS ANNOUNCE THE CANADIAN OCEANIA TOUR! JEFF SCHROEDER, drummer MIKE BYRNE andbassist NICOLE FIORENTINO—will embark on a North American tour launching October 2 in Winnipegincluding one night at Toronto’s Air Canada Centre on October 25th. Tickets go on sale Friday, August 24th at 10am at the Air Canada Centre Box Office, Ticketmaster.ca or chare by phone 855-985-5000. Look for the band to perform their critically acclaimed album OCEANIA–which entered the Billboard Top 200 Albums Chart at #4 and earned the #1 spot on the Independent Albums Chart this past June–in full and for the second half of the show they’ll play classics and deep cuts from their body of work. The PUMPKINS will be backed by visuals prepared by Sean Evans, whose most recent project was assisting Roger Waters on the newest staging of “The Wall.” THE PUMPKINS will be using new technology in video-mapping to create something new and previously unseen. A limited amount of VIP Packages will be made available giving fans access to an amazing, exclusive opportunity. In addition to a premium ticket or GA ticket with elevated viewing access, packages may include a 3-song Backstage Performance with the band including a Q&A, an autographed limited edition tour poster, an on-site VIP Concierge, a copy of the new CD OCEANIA, and exclusive merch. Visit http://www.smashingpumpkins.com/ for more information on these VIP Packages. OCEANIA (Martha’s Music/EMI Label Services/Caroline Distribution) was created by the band at Corgan’s private studio in Chicagoas a true album experience for listeners to fully immerse themselves in. The powerful 13-song collection was produced by Corgan and Bjorn Thorsrud and mixed by David Bottrill. Marking THE SMASHING PUMPKINS’ 7thstudio record and 7th Top Ten album, it is “an album within an album,” part of their 44-song work-in-progress TEARGARDEN BY KALEIDYSCOPE. Of OCEANIA, USA Today said Corgan’s “creative engines are roaring with an intensity and creative pluck unmatched since his mid-’90s classics” (6/19/12); the Los Angeles Times said it is “the best thing the Pumpkins have done since the ‘90s” (6/19/12); and the Chicago Tribune called it “Corgan’s best work since the ‘90s” (6/15/12). The PUMPKINS are coming offa successful tour of Australia, New Zealand and South Korea that ran from July 26-August 14. They headlined festivals and, at their own shows, performed OCEANIA in full, followed by a set of classics and deep cuts (see critical quotes below). THE SMASHING PUMPKINS have created one of the most acclaimed bodies of work in musical history having sold more than 30 million albums, and won multiple Grammy Awards in the process. Formed in Chicago in 1988, they released Gish, their influential and platinum debut in 1991, which was followed by albums including the nine-time platinum Mellon Collie And The Infinite Sadness and the four-time platinum Siamese Dream, as well as the platinum certified 1998 album Adore. The pivotal group’s many hits defined the alternative music era and continue to resonate on modern rock radio, influencing a whole new generation. The PUMPKINS returned in 2007 with their acclaimed sixth album Zeitgeist. They have since remained on the cutting edge of music and technology with various online releases. In June 2012, the band released the album Oceania, via Martha’s Music/EMI Label Services/Caroline Distribution. Marking THE SMASHING PUMPKINS’ 7th studio record, it is “an album within an album,” part of their 44-song work-in-progress Teargarden By Kaleidyscope.